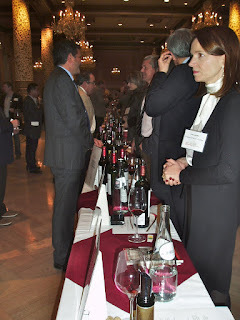 It's not every day that you can mark a beautiful French woman from across the room, walk right up to her, and spit out a mouthful of wine without her batting an eye, but at the Union Des Grands Crus de Bordeaux 2008 Vintage Tasting that's exactly what I did, over, and over, and over again. I wasn't the only one either. In fact Monday's crowd was a much more professional and wine savvy group than any tasting I have ever been to, not to mention a more international, and much better dressed one (general note that French men have a corner on the "making American men look like slobs" market). That makes sense given that this tasting is not open to the public, but rather is a trade and media focused event designed to move wine from producer to wholesaler and retailer. Translate that as: the French are in full sales mode, and most everybody in the room is at work in some form or fashion. For those not familiar, every year the Bordeaux Producers Union packs up and crosses the pond for a tour of a select few US cities. One of those cities happens to be Chicago, and this year I attended for the first time. Buyers from all over the Midwest were in attendance foaming at the mouth for a chance to rub elbows with french winemakers. With 96 châteaux in attendance, pouring 114 wines, Bordeaux was well represented. With a smattering of sweet Sauternes and Barsac wines, as well as a handful of mostly Graves dry whites, Bordeaux's finest displayed their efforts of mostly red wines. In essence this traveling trade show amounts to wine's Fashion Week. Grouped by the region the wines came from the châteaux were pouring from behind tables spread throughout the ballroom at the Drake Hotel. The event lasted for 4 hours and I needed the entire time to make it through the vast array of wines on hand. 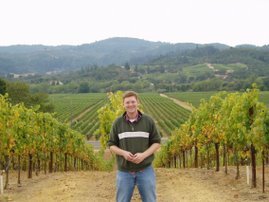 My entire set of tasting notes is posted on Cellar Tracker. I've called out some of the more standout wines a little farther down the post. There is no question this event drew the major buyers from around Chicago and the Midwest as I saw representatives from House of Gluntz, Chicago Wine Company, and Binny's throughout the room. Additionally Costco was there along with several owners of smaller shops, and what appeared to be a few lucky non industry folks. I think looking back over my notes that I'm most impressed with the Margaux and St. Julien wines. My soft spot for Pessac-Leognan remains, however. I liked both of the Listrac wines that were present, but would like to see more from the region to really form an opinion. Poujeaux probably stands out as the value of the tasting, and Clarke the biggest "find" for me. Both came in around $25 US. I think it would be unfair to pick a favorite of the day, as there is no way I can remember with the necessary detail to do so. As a whole the tasting was brilliantly presented and executed. There was nothing, except maybe more spittoons, that I wanted for. I'm already looking forward to 2009. And with '09 being hailed as the best Bordeaux vintage ever (whatever that means) and my son being born in '09, I'm sure I will find a lot to get excited for next year. Though probably no secret to most wine drinkers in Chicago, Wine Discount Center recently popped up on my radar. After a Groupon deal for $30 worth of wine for $15, I was alerted to a Highland Park location that I had no idea existed. I had been visiting the Buffalo Grove location way back when it was still there, but after it closed up shop, Wine Discount Center was out of sight and out of mind. I have been attending tastings when I get a chance and have been pleased with what I've been finding there. In addition to random findings, I came across a bottle of '09 Marcel Lapierre Morgon a couple weeks ago. After my experimenting with Beaujolais I knew this particular vintage and producer were getting some serious attention. I took a bottle home for the holidays and it was every bit the joy it was hyped to be. I've found a few other nice bottles there aw well including an '08 Alta Maria Chardonnay, and a soon to be purchased '09 St. Urbans-Hof Ockfener Bockstein Riesling Spatlese. Anyway, wine recommendations aside, the store always comes in on the cheap side. There are no case discounts, the theory being that the discount is already built into the price. I'm not sure I find it to be 10% cheaper than elsewhere, but I never feel as if I'm being taken for a ride. I highly recommend that if you haven't been, you go check them out. They have locations in Highland Park, Chicago, Barrington and Forrest Park. The staff seems very knowledgable, and always willing to help me hunt for something. Plus they seem to know every wine they have in the store, which is always a plus when you are looking for something new.